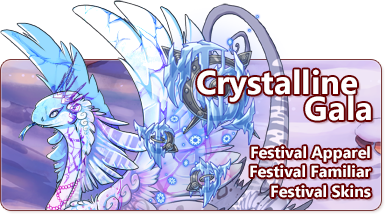 This month, all of dragonkind come together to participate in the Crystalline Gala. This festival celebrates the ice flight. Our most prized possession, Eternal Snow, can be found by using any gathering profession in the ice territories this week. Neutral and ice-aligned monsters also have a chance to rarely yield these items as drops in the Coliseum. They may be crafted at Baldwin's Bubbling Brew using alchemy reagents. A clump of frigid snow. It does not appear to melt, even when placed somewhere warm. This can be traded at the Festive Favors shop during the Crystalline Gala. The Festive Favors holiday stall is now open for the duration of the holiday and you may trade in Eternal Snow for exclusive items. It will remain open until the holiday comes to a close on Sunday, February 3 at 06:00 server time. 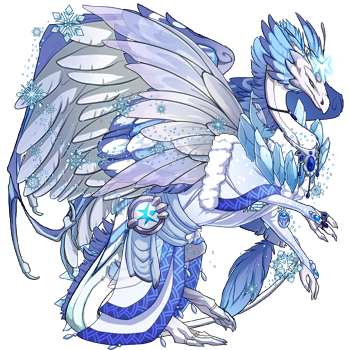 The Longneck of the Southern Icefield have a storied history of coexisting with dragonkind, and many are happy to guide trekking clans through the most dangerous mountain passes. Most Longneck clans are peaceful, but if you look hard enough, one can find a handful that use this preconception to nefarious ends. The results are in! Congratulations to all of our winners! For the remaining duration of holiday, 12 of these skins will be stocking in the Treasure Marketplace and six of them will very rarely gathered by digging in ice territory or by battling in the coliseum. 2 of these skins will be exclusive to Baldwin's Bubbling Brew. Crystalline Gala 2019. (1/14) Designed by tasmanicus. Crystalline Gala 2019. (2/14) Designed by Window. Crystalline Gala 2019. (3/14) Designed by Nyebe. Crystalline Gala 2019. (4/14) Designed by Spassow. Crystalline Gala 2019. (5/14) Designed by Meeboo. Crystalline Gala 2019. (6/14) Designed by protowilson. Crystalline Gala 2019. (7/14) Designed by raclette. Crystalline Gala 2019. (9/14) Designed by Saerino. Crystalline Gala 2019. (10/14) Designed by Kaenith. Crystalline Gala 2019. (11/14) Designed by Ventoaureo. Crystalline Gala 2019. (12/14) Designed by Medisin. Crystalline Gala 2019. (13/14) Designed by Arkenrall. Crystalline Gala 2019. (14/14) Designed by Lynnora. Congrats to the winners and honourable mentions of the Skin/Accent contest. Your work looks absolutely stunning!